In this documentation page, we will lay out the overall architecture for Modin, as well as go into detail about the implementation and other important details. This document also contains important reference information for those interested in contributing new functionality, bugfixes, and enhancements. The Modin DataFrame architecture follows in the footsteps of modern architectures for database and high performance matrix systems. We chose a partitioning schema that partitions along both columns and rows because it gives Modin flexibility and scalability in both the number of columns and the number of rows supported. The following figure illustrates this concept. Currently, each partition’s memory format is a pandas DataFrame. In the future, we will support additional in-memory formats for the backend, namely Arrow tables. We currently use the pandas.Index object for both indexing columns and rows. In the future, we will implement a distributed, pandas-compatible Index object in order remove this scaling limitation from the system. It does not start to become a problem until you are operating on more than 10’s of billions of columns or rows, so most workloads will not be affected by this scalability limit. Important note: If you are using the default index (pandas.RangeIndex) there is a fixed memory overhead (~200 bytes) and there will be no scalability issues with the index. The figure below outlines the general architecture for the implementation of Modin. Modin is logically separated into different layers that represent the hierarchy of a typical Database Management System. At the highest layer, we expose the pandas API. This is discussed in many other parts of the documentation, so we will not go into detail for it here. We will go through all of the other components in some detail below, starting with the next highest layer, the Query Compiler. The Query Compiler receives queries from the pandas API layer. The API layer’s responsibility is to ensure clean input to the Query Compiler. The Query Compiler must have knowledge of the in-memory format of the data (currently a pandas DataFrame) in order to efficiently compile the queries. The Query Compiler is responsible for sending the compiled query to the Partition Management layer. In this design, the Query Compiler does not need to know what the execution framework is (Ray in this case), and gives the control of the partition layout to a lower layer. At this layer, operations can be performed lazily. Currently, Modin executes most operations eagerly in an attempt to behave as pandas does. Some operations, e.g. transpose are expensive and create full copies of the data in-memory. In these cases, we keep some metadata about the operations and queue them up so they are somewhat lazy. In the future, we plan to add additional query planning and laziness to Modin to ensure that queries are performed efficiently. The Partition Manager is responsible for the data layout and shuffling, partitioning, and serializing the tasks that get sent to each partition. The Partition Manager can change the size and shape of the partitions based on the type of operation. For example, certain operations are complex and require access to an entire column or row. The Partition Manager can convert the block partitions to row partitions or column partitions. This gives Modin the flexibility to perform operations that are difficult in row-only or column-only partitioning schemas. Another important component of the Partition Manager is the serialization and shipment of compiled queries to the Partitions. It maintains metadata for the length and width of each partition, so when operations only need to operate on or extract a subset of the data, it can ship those queries directly to the correct partition. This is particularly important for some operations in pandas which can accept different arguments and operations for different columns, e.g. fillna with a dictionary. 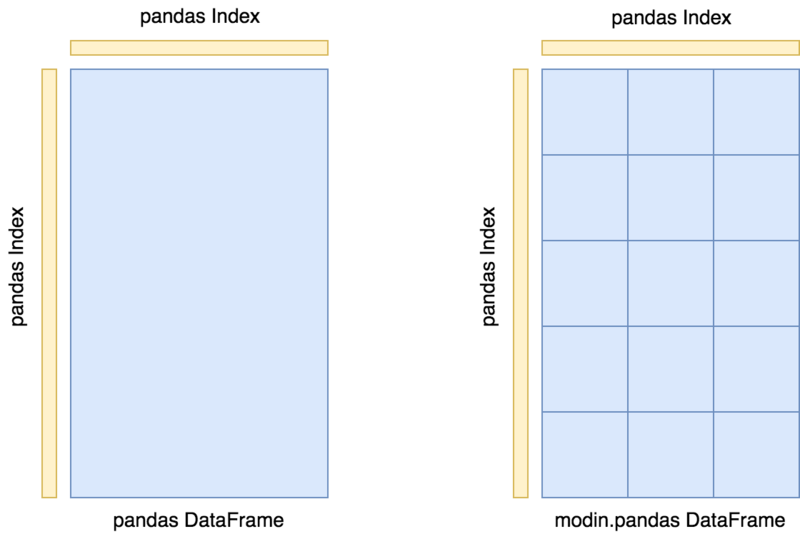 Partitions are responsible for managing a subset of the DataFrame. As is mentioned above, the DataFrame is partitioned both row and column-wise. This gives Modin scalability in both directions and flexibility in data layout. There are a number of optimizations in Modin that are implemented in the partitions. Partitions are specific to the execution framework and in-memory format of the data. This allows Modin to exploit potential optimizations across both of these. These optimizations are explained further on the pages specific to the execution framework. This is the list of execution frameworks and memory formats supported in Modin. If you would like to contribute a new execution framework or memory format, please see the documentation page on Contributing. Uses the Ray execution framework. The in-memory format is a pandas DataFrame.